Russia 2012: Putin and Medvedev to Square Off? Over the past couple of months, maybe even over a year, things in Russia have certainly been interesting to try to follow. As in the United States, Russia will be facing presidential elections in 2012. But it seems that there may be a face-off with current President Dmitry Medvedev and Prime Minister Vladimir Putin for the top spot. As much as anything can be sure in the world of Russian politics, there is no likelihood of Mr. Medvedev running off in open competition against Mr. Putin in next year’s presidential elections. The men are political intimates and have been for a decade. There is a bond of trust between them that would be remarkable in any country’s leading politicians.Another thing that is not changing is Mr. Putin’s seniority in the partnership, at least not immediately, and not to any degree that makes a jot of difference to the safety of foreign investments in Russia. There is, probably, also no change in the relative realities of power and office in Russia. Mr. Putin, for the past four years, has not needed to be in the Kremlin to exercise effective supreme power. Whether, after 2012, Mr. Putin is in the Kremlin and Mr. Medvedev is in the White House, or the other way around, is of limited importance. They will continue to exercise real power. The only change that one can be truly sure of is a generational one, and this will be a very gradual one. Russian political cycles have tended to be longer than those in western Europe. Its transition from centrally-planned, autarkic and dysfunctional empire to a more pluralistic, modern and dynamic element of a multi-polar world is lasting decades. Even if it has been inevitably buffeted by external events and retarded by misjudgments and creeping venality, that process is Mr. Putin’s life mission. 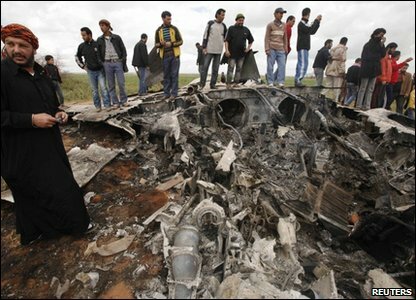 A United States F-15 Eagle crashed in Libya as coalition forces continued a third night of air strikes. It is being reported that the crew was recovered, without any injuries. But, that’s not the end of it. The under reported part of this war, is just that. Is it war or is it not? That question remains unanswered, along with what the real mission is. Obama is still wishy-washhy on the subject. But what about the cost? The initial blast of 114 Tomahawk Missiles cost a staggering $70M at $500,000 a piece. And with the crash of this F-15, it will add another $30M! Bringing the current cost to $100M! Would it not have been easier to just give Gaddafi the money to go away? After all, we don’t even know if all this effort will out him or not. Dept. of Defense | March 19: Arleigh Burke-class guided-missile destroyer USS Barry (DDG 52) launches a Tomahawk missile in support of Operation Odyssey Dawn. With the approval from the United Nations, the coalition forces have begun their attack against Muammar al-Qaddafi and his forces. The United States is leading attacks as more than 100 Tomahawk missles were launched toward the shores of Libya, hitting more than 20 intended targets including surface-to-air missiles, early warning sites, and key communication modes. “We cannot stand idly by when a tyrant tells his people there will be no mercy,” Obama said in a statement from Brazil. “It is now necessary to open the stores and arm all the masses with all types of weapons to defend the independence, unity and honor of Libya,” Qaddafi said in a speech broadcast on Libya state television, according to Reuters. He also warns that weapons depots are being opened to arm the Libyan people in defense. After the Mega-Quake that hit Japan with a manitude of 8.9, the largest ever for Japan, aftershocks continue to be felt with reoprts ranging up to 30 plus. Also causing problems, in Northern Japan a nuclear power plant had an issue with one of the cooling systems that caused it to be shut down. The IAEA was quick to report that there were no leakage problems, and that the plant had many safety systems that functioned properly. And, along with that power plant, others have also shut down causing many to be without power. Reports are also filtering in of higher death tolls, with 51 confirmed and thousands feared.